An unattended mobile phone may be irresistibly tempting for others to invade your life. It doesn’t matter who is going to use your phone and how while you don’t keep an eye on it. Whether they are your parents who are interested in your personal life, your friends who decided to play a joke on you, or a thief who decided to profit by an unattended phone. Anyway, you will be upset by this intruder or you might never even know of this invasion. Now an intruder will be less likely to quietly gain access to your phone. 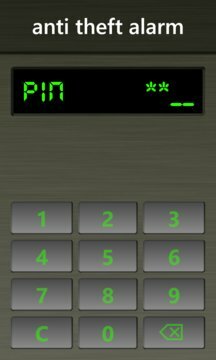 When leaving your phone unattended, activate this app and go about your business without worrying. 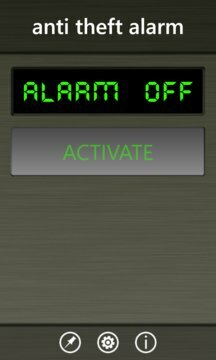 As soon as the phone senses that it is being moved, it will activate the alarm mode and beep. Hearing the alarm, you will be able to catch the intruder red-handed and that person would be in trouble trying to excuse what was done! Even if the intruder eventually manage to disable the app, it will be impossible to activate it again to cover up the fact of the invasion. Now you'll always know if anyone used your phone while it was unattended!